The French Gothic-style Westminster Presbyterian Church holds a commanding position in the modern streetscape of Pasadena. Since 1928 this stately building has been the location of countless “I do’s” by not only those of the Presbyterian faith, but couples seeking a grand ceremonial setting to accommodate a guest list of up to 500 people. Its 150-foot bell tower dominates the church, inspired by the famed Roman Catholic Église St. Maclou in Rouen, France, and its intricate exterior carvings are impressive to say the least. The Westminster Presbyterian Church exudes grandeur and elegance, all of which will translate into your wedding ceremony photos. You can make last minute preparations in their bridal room downstairs, while the groom can use the upstairs lounge, before entering the church through its dramatic three-arched portico. Walk down the aisle between its rich dark mahogany pews, beautifully decorated with floral arrangements, while cast iron chandeliers hang from the ceiling above and stunning, arched stained-glass windows line the edges. The elegant altar is backed by another piece of magnificent stained-glass artwork, while the original Reuter Organ pipes frame the sides. You can opt to utilize the choir pews for vocal accompaniment throughout your hymns, or use the space for a live string quartet. After exchanging vows and lighting the unity candle, walk back down the aisle as husband and wife to join your family and friends in the outdoor courtyard. This is an ideal opportunity to capture couple portraits, bridal party portraits and family formals, or return through the side entrance to take your wedding photos at the altar. While most couples use Westminster Presbyterian Church solely as a wedding ceremony venue, you can host your reception in the adjacent Morrison Hall. In addition to rich wooden panels and a stage with red velvet curtains, there is a service kitchen for your chosen caterer to use. Because the Westminster Presbyterian Church is a sacred venue, there are restrictions on wedding photography, as well as the alcohol permitted on the premises (only wine and champagne). When booking the church you should also be aware that a minister and premarital counseling are included in the fee and both are compulsory. 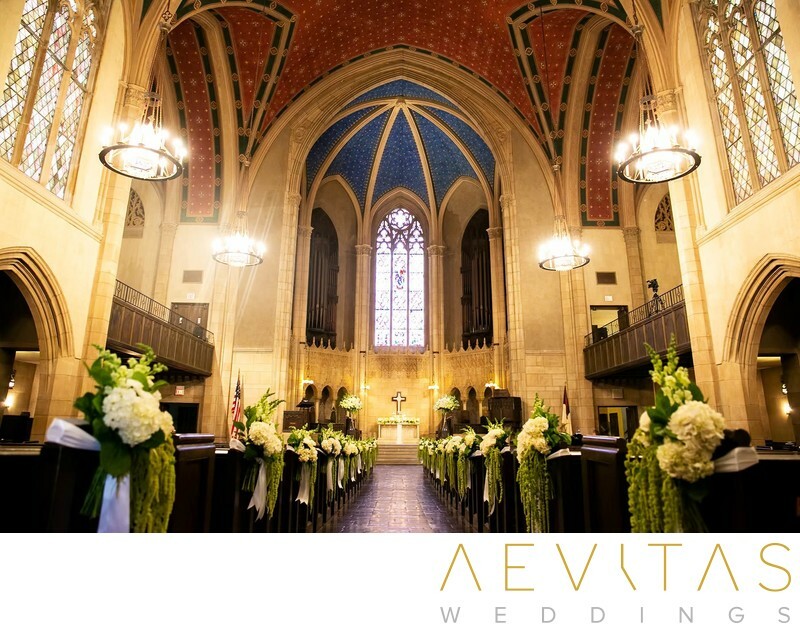 Despite the conservative rules of the Westminster Presbyterian Church, it remains an exquisite Los Angeles County wedding ceremony venue, and for couples wanting to wed in a house of God, surrounded by extended family and friends, its ambiance and large capacity make it ideal.